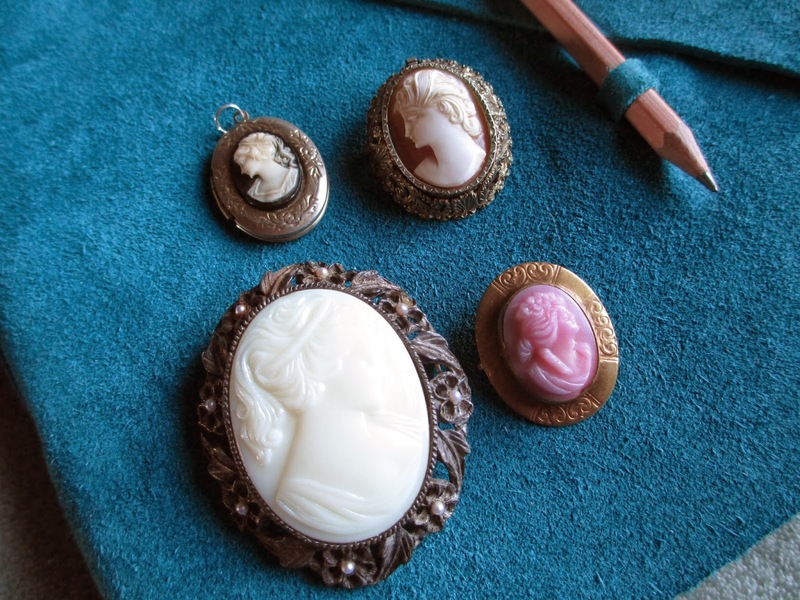 1) White & Pink Cameos - I have a traditional shell cameo in a gold setting and a black cameo in a silver locket setting (the two on top in the picture), so these two new colors make for a good addition to my collection. What I love about cameos is that they're an easy way to add vintage to an outfit: they go with so many different looks, especially now that I have four different colors to choose from. Although the white cameo has the usual pin back plus necklace loop, the pink one only has the pin back. I'd rather be able to wear it as a necklace, but a pin sometimes works, too. 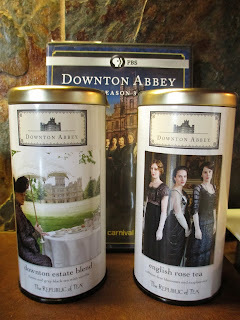 2) Downton Abbey Teas - You know that I'm not one of the big fans of Downton Abbey. But I watched it, and The Republic of Tea is generally a good company, so I let myself get excited about these teas. (I resisted getting any of the jewelry: while the designs are pretty, I wish they were made out of silver.) The English Rose Tea tastes like raspberries; it's nice if you like berries. The Downton Estate Blend, however, is a favorite of mine. It's supposed to be Earl Grey with vanilla, but I think it tastes like coffee cake, so nice and sweet. I'll lament the end of it. 3) Pie Town Soap Co. - Sedona Song: Red Rock Soap - Being that it was coming on Christmas, I chose a soap with pine in it for my newest Pie Town selection. It also has juniper and lavender, along with flower and wood notes. The "swirl of Sedona red earth" gives just a touch of pink to the white soap; it's a much less feminine look than some of Pie Town's soaps, making this a suitable soap for men or women. Pine is the primary scent; the mix of other notes, though, balances it out to feel like a true trip to Sedona. 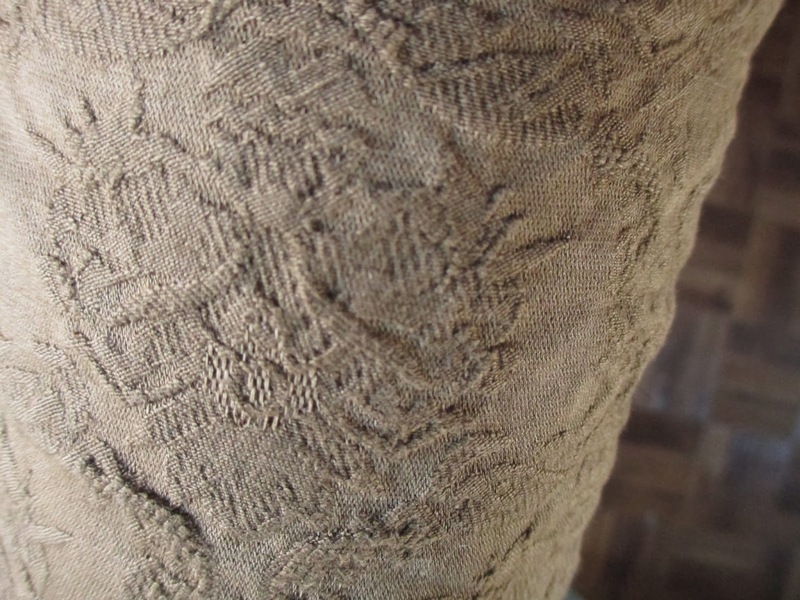 4) Free People Pants - The color of these pants attracted me because it looked like it would fit in with my closet's color palette; then, the texture gives them a vintage feel for added interest. When I tried them on, I discovered the next nice thing about them: they're designed to fit just above the ankle, so that means that they fit me just right as a regular pant (not too long, like most pants fit me, that is). 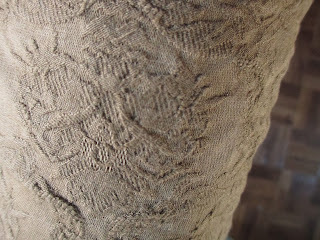 The material is stiff at first, which I'm hoping means that they will take longer to wear out. 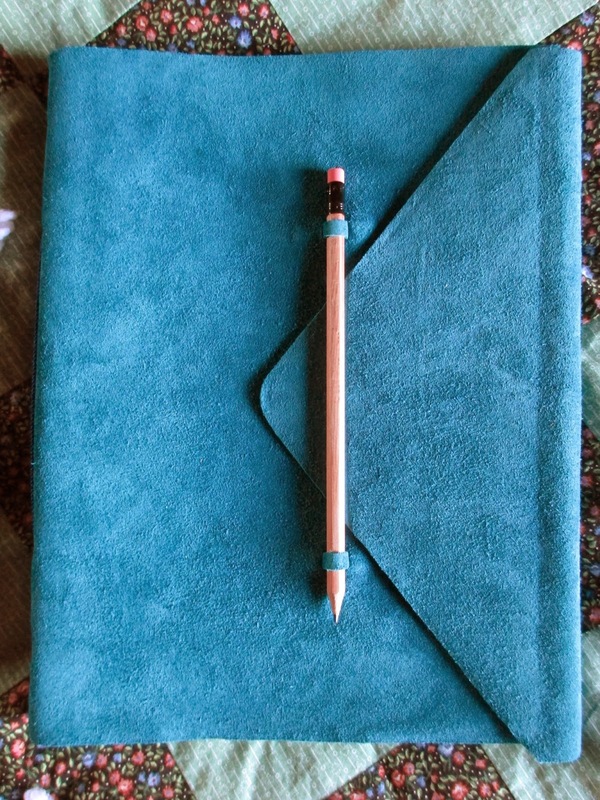 5) Blue Suede Notebook - I already have the smaller, green version of this notebook. This larger, blue one also makes me happy. 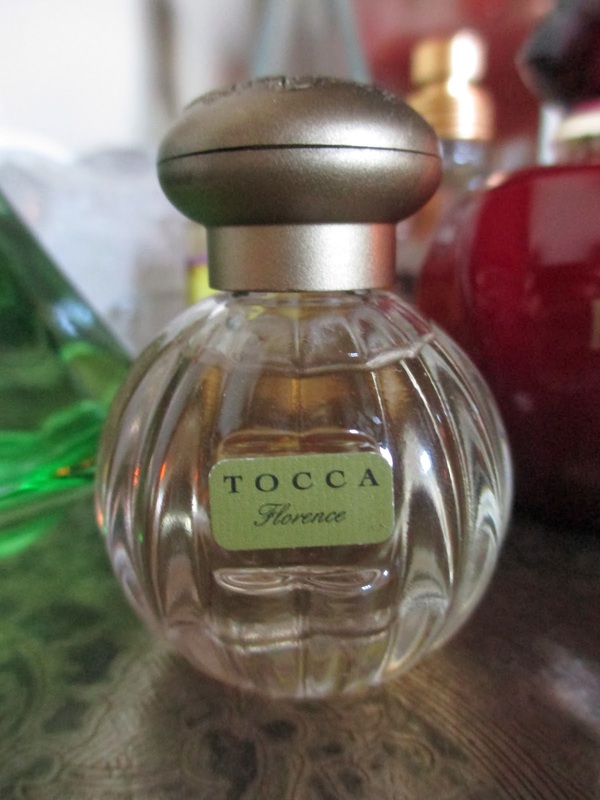 6) Tocca Florence Perfume - It was about time I got a Tocca perfume. After smelling their range, I decided that Florence was my favorite. It smells like honeysuckle to me, although it's a mix of many scents, including bergamot, violent, grapefruit, gardenia, and musk. 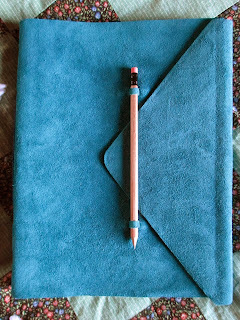 It also happens to be accented with my favorite color, green; do you think that's coincidence? This is one of the mini bottles, but it's still the same cute shape as the full sized ones. 7) Alluring Arizona Book - On a shelf in California I spotted this book. It's very pretty and looks great with my Arizona books from the Images of America series, but I might also want to read some of the text in it. In some sections, the author describes visiting various places in the state, and you know I love people appreciating Arizona. 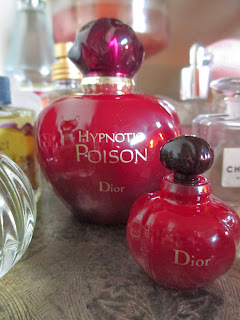 8) Dior Hypnotic Poison Perfume - Yes, I just liked this perfume because of the bottle. It looks like Snow White's apple; what's cooler? As perfumes go, I do like the scent; it's just that it smells more like perfume than most of my perfumes. I also have the tiny baby apple to go with it. 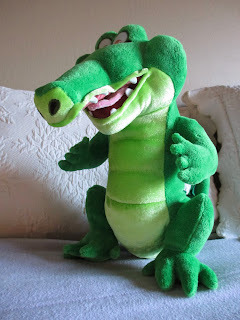 9) Crocodile Plush - You know what one of my favorite Disney characters is? The crocodile from Peter Pan. Before I liked him because he was cute; now I like him for his symbolism. But since it's still a cute crocodile, I caved and bought the plush while it's available. Won't he look great on a bookshelf next to a copy of the book? 10) Antonio Melani Cashmere Sweater - Let's transition from green crocodile to green sweater. I have one or two Antonio Melani sweaters that I love because of how comfortable they are and how classic they look, so I was instantly interested when they came out with these basic, 100% cashmere sweaters this year. My first completely cashmere sweater, then, is bright lizard green. The fit is perfect: the length isn't too short and it's neither too loose nor too fitted. As long as the moths stay away, I intend to have this one for years to come. 11) Guess Watch - Ever since I started wearing a watch again, I wondered if maybe I should get a semi-decent one instead of a cheap one from World Market. 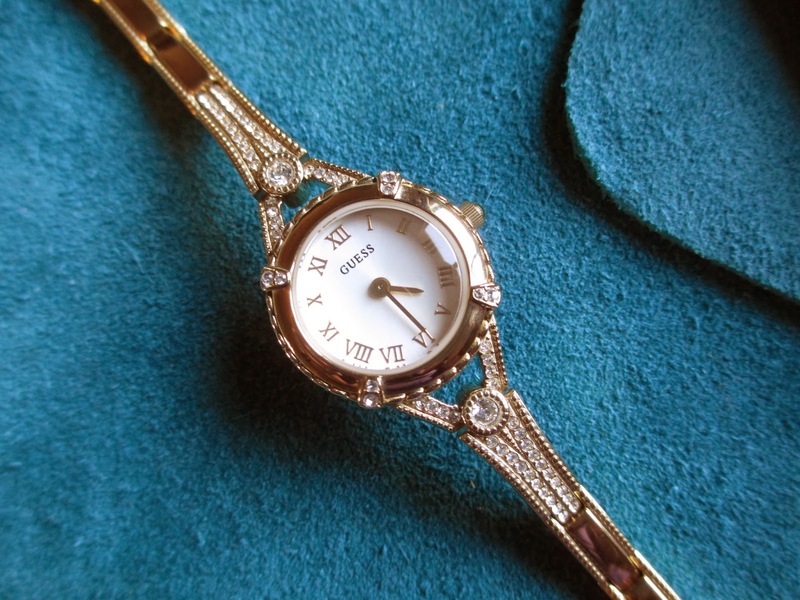 This Guess watch is perfect for me because it has a small face to go with my small wrist and a vintage touch to fit my style. The Roman Numerals are pretty and also make it easy to tell the time with a glance. It also came in Silver and Rose, but I thought that the Gold suited me best. 12) Pillow Sole Socks - Sometimes when I know I'll be walking a lot and my socks don't show under my shoes, I'll put on a pair of Nike or Puma socks: the extra cushion to them really helps feet stay comfortable. I also wore them while doing holiday baking this year. But, you know, sports socks aren't usually that pretty. I've started to like my socks to be pretty. Plus, sometimes sports socks are too thick to fit into certain shoes. Enter Pillow Sole socks. Some have pattern; some don't. 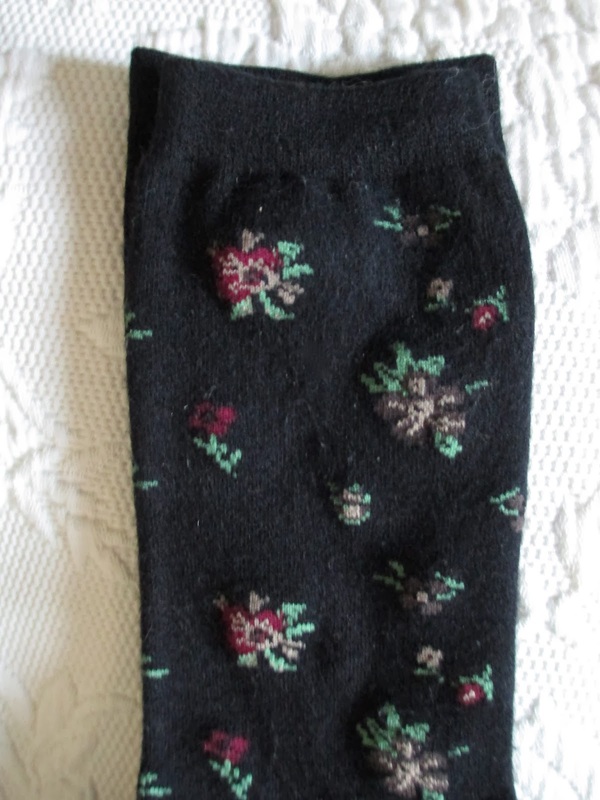 The top portion is like a regular sock, but they have a little bit of cushioning on the bottom. So you can wear them like regular socks, but they're a tad more comfortable. I chose the flower pattern instead of plain. 13) Secret Garden Calendar - Now that I've started using a calendar again, it's always a challenge to find one that I can bear looking at all year. I want it to be something that, visually, I'm willing to put on my wall. That I want to put on my wall. So this year it fell to Anthropologie. This calendar has only one page per month instead of two: the days are right in the middle of the design instead of separated. Since I don't really write on my calendar (I just like to have it to be able to visualize time), this works for me. And the simple floral designs are much less tacky than plenty other calendars. They're even pretty. And that's the end of 2013. Just one more day, then we will move into 2014; Happy Approaching New Year.